It’s time for another White Rose Crafts Blog Hop! This month we are celebrating Winter Wonder! We will be creating inspiration projects featuring snowflakes, snowmen, ice, winter critters, skating, sledding and everything else that goes along with this cold and beautiful season. In addition to the incredibly talented WRC design team, we are also very excited to be collaborating with several members of the Doodles Paper Playground team. We invite you to hop along with us, and be sure to leave a comment on every leg of the hop! We will be giving away prizes and offering a Blog Candy Discount Code, so be sure to visit every stop on the hop for more chances to win! Now, go get inspired! Let me just say I had a lot of fun with this. 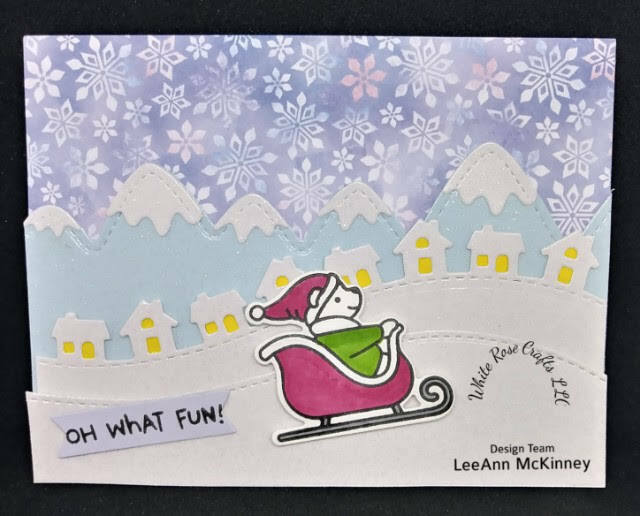 using Lawn Fawn's "Oh What Fun" Stamp and Die sets. The white layers and mountain caps are made using Lawn Fawns Pixie Dust Sparkles card stock. The Snowflake background is from Wild Rose Studio's Festive Florals 6"x6" paper pad. Please hop along and visit the other design team members blogs, leave comments for all of us for your chance to win one of the fabulous prizes. Prizes: One winner will receive a $15.00 store credit coupon code to White Rose Crafts, and 3 lucky winners will receive a full size package of Frozen Sparkle Blends, sponsored by Doodles Paper Playground! You must be at least 18 to enter. Open Internationally. Winner is responsible for all shipping costs for Gift Code. Shipping for Sparkle Blends prize will be covered by Doodles Paper Playground. · Entries must be received no later than 11:59PM EST Friday, November 23, 2018. Prize will be issued in the form of the form of a one-time use coupon code valued at $15.00. Coupon code is valid at www.WhiteRoseCraftsLLC.com and expires on December 1st, 2018. Coupon code is not valid on shipping & cannot be combined with other coupons or offers. · Winner will be drawn on Saturday, November 24th & posted on the White Rose Crafts blog & Facebook page and will be notified by email, if possible. · Winner will have 3 days to contact us to claim prize. If prize is not claimed within this time frame, a new winner will be drawn. No Exceptions. · This giveaway is not sponsored, affiliated or associated with Facebook any associated entity. All prizes furnished by White Rose Crafts LLC and Doodles Paper Playground. Congratulations, Carla! You are the winner of one of three Doodles Paper Playground: Sparkle Blends "Frozen" blend. Please send an email to whiterosecraftsllcblog@gmail.com with your address, no later than Tuesday November 27th, to claim your prize! That is such a darling winter scene and so cute with the bear in the sled. I love the snowy sky too. Such a darling scene! I love how you designed this! Cute scene. Love the mountains and snow in the background. The way you made your snow scenes is so creative!